Explore the history of the New Forest National Park. If you have never been to the New Forest before it can come as a bit of a surprise. It is evidently not ‘new’, nor is it a densely wooded ‘forest’. It is of course extensively wooded but it is an area, open in character, a wilderness in which heath land and glades of woodland spar for the walkers attention. Cut through with streams and fords to be crossed and with its feet dipping into the Solent waters, the New Forest is an explorers paradise. There is an abundance of history in the New Forest. It is a unique landscape in England in terms of its wildlife, vegetation and even its laws. Many history books tell us that William the Conqueror made the New Forest to hunt deer. In doing so, they say he destroyed a large tract of populated fertile ground and laid waste to villages and destroyed churches. How likely is this? Probably not very, the Medieval chroniclers got very carried away in their story telling about the history of the New Forest. It was known before the Conquerors time as ‘Ytene’ meaning Jute. The Jutes populated this part of the south of England spreading up Hampshire’s river valleys but they were not the first ones to rest awhile in the forest. The area is scattered with Bronze Age barrows, they probably began deforesting the area and grazing animals and the Romans made pottery here. As for it being a fertile area, this is not the case. The soil is thin, made up of wedges of thick clay (hence the Roman potteries), loose sands and gravels, with ribbons of marls. The vegetation of beautiful oaks and beeches and birches, gives way to scrub-land heaths of gorse, heather and rush. By the time William the Conqueror arrived, it was a forest of open glades and oak and beech woodland, perfect for hunting deer. He enlarged the boundaries of the New Forest, imposed ‘Forest Laws’. You could allow your hogs to snuffle acorns and grow a little in the forest but if you killed a deer, then you would be put to death, such was there value to the Kings. If you are coming on a visit, staying in nearby Southampton, the Jurys Inn Hotel group have produced a map entitled ‘The Enchanted New Forest’, which pinpoints some of the history to explore in the area. With thanks to Jurys Inn for allowing us to embed the map here. Begin an exploration of the history of the New Forest by looking in Domesday, it is the only forest in England assessed in such detail. Probably the most famous piece of history in the New Forest is the death of King William II in 1100. Shot in the chest with an arrow let loose from the bow of Sir Walter Tyrell and his body then ignominiously hefted onto the cart of the charcaol burner Purkis and wheeled to Winchester where the King was quickly and rudely buried. 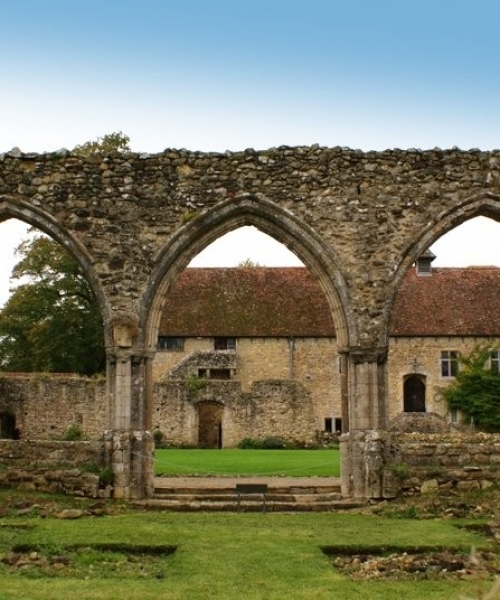 The great abbey at Beaulieu and Beaulieu House, home of the Montague family, along with the motor museum, draw in visitors from around the world. It has been associated with royal households for a thousand years. The banks of the Beaulieu River sometimes give up their ghosts of old shipyards, building for the early English Navy. A visit to Bucklers Hard reminds us of a period in New Forest History when the timber for some of our greatest ships was cut from the New Forest and brought to the ship yards on the river. Read about the wreck of the Grace Dieu, King Henry V’s ship. The river played its part in WWII when it was used to in all manner of secret ways. In the run up to D-Day the Beaulieu river was packed with landing craft and other support vessels, and Exbury House, at the time, HMS Mastodon, was closely involved in the planning and preparations for the Normandy landings. The rights of the ‘Foresters’ are again unique in England and concerned with the pasturage of ponies, cattle and sheep and the turning out of pigs at pannage time. You are never far from wildlife in the New Forest, as New Forest ponies roam at will. But what of the intriguing snippets of history in the New Forest? Bratley Water, the supposed scene of Charles Kingsley’s ballad of the New Forest, about the tale of a keeper’s daughter and her deer poaching lover, who meets her father in the forest and they kill each other. Visit the New Zealand War Memorial in Brockenhurst church graveyard and whilst there visit the grave of Harry Brusher Mills, snakecatcher. Go to Ellingham church to the grave of poor old Alice Lisle, executed in Winchester by the order of Hanging Judge Jeffries. Leave the heart of the New Forest and explore its history on the coast. The town of Lymington with its old town quay and smuggling history, once described by writer Daniel Defoe, as ‘teeming with smugglers and all sorts of desperados.’ King Henry VIII’s magnificent forts, Hurst Castle and Calshot Castle on the southern fringe of the New Forest, look out over the waters of the Solent. They are a reminder of how real the threat of a French invasion was, on this southern shore. Visit the New Forest National Park website to discover a wealth of activities in this ancient part of Hampshire and soak up some of the history of the New Forest National Park.